Cushion Canvas: A smooth modern design. Premium cotton canvas, printed with pigment inks and with two coats of varish, stretched over a deep 40mm frame with curved sides that softly taper towards the wall. Hangs flush to the wall. Choose from a brilliant white matt canvas or our premium 100% cotton canvas with colour enriching, water repellent satin varnish coating. Quality, solid pine frames with laminated edges from trees cultivated in sustainable forests. 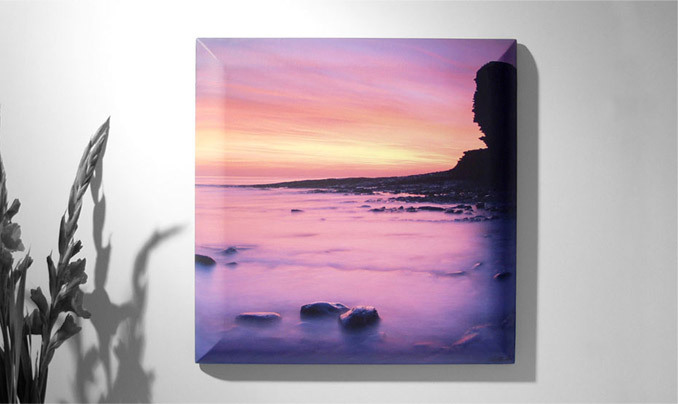 Create your personal one-off art piece with your own digital image onto our exciting Cushion Canvas. All our gallery images are available as Cushion Canvas.